Who Can Afford Sustainable Intensification? Can I? Source: Farmer walks in maize field. No. Personally, I cannot afford sustainable intensification. For reasons irrelevant to this blog. Not that I have any interest to, in any way, invest in agriculture, even though most people in my country(Malawi) depend on it for food and income. So who can afford sustainable intensification? In Africa. I look at some (not all) of the methods and inputs that go into sustainable intensification, with a focus on crops and whether not I or “big corporations”, but small-scale farmers in Africa can “practically/realistically” afford to practice sustainable agriculture. While the majority of the world’s hungry live in Asia, there are still 239 million people hungry in Africa, which is composed of mostly developing countries. Three quarters live in rural areas and are highly dependent on agriculture for food and income. FAO calculates that half of the world’s hungry are from small-scale farming communities. There has been a push for sustainable intensification as the solution to the worlds hunger problem, though the resources for it are still not readily available to small-scale farmers. According to FAO: “Sustainable crop production intensification is an ecosystem-based approach for improving sustainability in cropping systems. It has been defined as producing more from the same area of land while reducing negative environmental impacts and increasing contributions to natural capital and the flow of environmental services”. Sounds good right? More food, less damage to the environment and better but, less, resources used. Sustainable intensification is being adapted in tailored fashion but there are common methods and inputs associated with it. One method associated with sustainable intensification is precision farming. While GPS (Global Positioning Systems) is used in developed countries to place fertiliser in the right place and right amount, micro dosing, applying fertilizer using a cap of a soda bottle, is commonly used in Africa. A soda bottle cap is not difficult to come by but fertilizer on the other hand is very expensive. And when I refer to fertilizer I mean the inorganic, “chemical” kind that usually comes in bags. 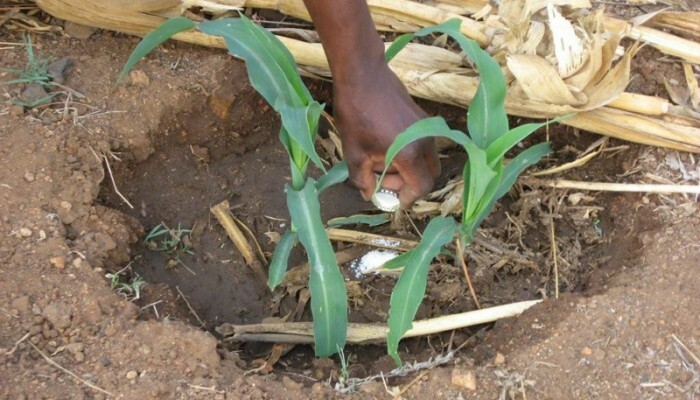 Source: Applying fertilizer to maize through micro dosing using a soda bottle cap. Some African countries have had fertilizer subsidy programmes for a long time, to aid smallholder farmers. Despite their evolution over the years, they are not enough and fall prey to corruption. Most farmers do not benefit from these programmes. So why not use manure? Soil has been stripped of nutrients and even with all the benefits of manure and disadvantages of fertilizers, fertilizers deliver nutrients quicker and hence show improvement faster as well. And what struggling farmer wouldn’t want that? An environmentally conscious smallholder farmer? When I asked myself can small holder farmers afford sustainable intensification, I initially had only money in mind. But as I went through my readings more than financial capabilities in purchasing inputs came through. The are dangers of in using pesticides and fertilizers, to the environment and people’s health. Assuming small-scale can afford enough them, can they afford prudence in the use of these inputs? A long-term view is preferred to short-term as you consider both now and later. When one factors a solution hunger into the short-term benefits vs long-term consequences of intensive use of fertilizers and pesticides, prudence seems to lean towards becoming a luxury and the short-term takes precedence. Irrigation is critical in sustainable intensification. However, in Sun-Saharan Africa only 4% of arable land is irrigated. Irrigation requires infrastructure, though at times knowledge will also do. Governments and various NGO’s provide this knowledge for free. Infrastructure is more challenging, even at a small-scale because of a lack of funding. Adaptability to climate change, through use of resilient seeds or crop diversification also factors into talk of sustainable intensification. However, this is faced with the same challenge as fertilizer. There are intensification practices that are affordable and currently practiced. They tend to use readily available inputs, such as the farmers themselves. Managing soil and reducing erosion through contoured terracing and mulching is a widespread example. Currently sustainable intensification is a tall order for a smallholder farmer with all the resources it requires. The benefits of the prudent use of fertilizer, adapting to climate change, reducing greenhouse gases, building up natural capital all while maintaining resilience cannot be reaped without significant investment. Small holder farmers alone are currently unable to practice sustainable intensification entirely. While they may be able to practice certain aspects of it, a more wholesome practice is sought and according to FAO, small farmers still face a variety of resource limitations. This requires more investment, support and also calls for cooperation of various stakeholders (government and NGO’s) to help make sustainable intensification an affordable reality.